Once the virtual disks/targets are created, each of the cluster servers must initiate a connection to them via Microsoft’s iSCSI Initiator. From “Administrator Tools” in “Server Manager”, start “iSCSI Initiator”. Select the “Targets” tab and enter the Network Name or IP address of the clustered iSCSI Target created in the previous step. Select “Quick Connect”. New panel should indicate that “Login has succeeded”. Click OK to hide the panel. 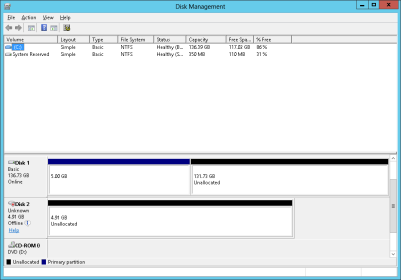 Start “Disk Manager”. The new iSCSI virtual disk will be displayed and can be initialized. Right-click on the disk(s) to bring it online. Create the new volume and assign the drive letter.